The White Tank Mountains are at the western edge of the Salt River Valley. They run north and south, and if you live in Glendale, like I do, they are very prominent. And if you're like me, you may have wondered what the name “White Tanks” means. A white tank is an old-fashioned term for a place with clean water that is accessible in a canyon. Nowadays, we still use the term for a water tank, although of course it would be made of metal. A water tank in a mountain is the same thing, except that it's made out of, well, part of the mountain. If you're wondering why a mountain range would be described based on the fact that you could find water there, you need to time-travel back to the days before Phoenix even existed. The White Tanks were a place where travelers could get water on the long stretch between the Gila River and Wickenburg, where the Vulture Mine was. And if you look at a map and realize that the travelers are going out of their way, as they were traveling up from Maricopa Wells, which was just north of where Maricopa is nowadays, you have to consider that they were mostly interested in a guaranteed water supply, which the White Tank Mountains had. Of course, if you were traveling there, you risked upsetting the people who guarded that area, the Apaches. But the Vulture Mine was producing so much gold that people risked it. And not just the miners, there was regular traffic there, coming all the way from California, supplying the things that the town needed, like food. So, the next time you visit the White Tank Mountains, squint your eyes and make all of the buildings vanish in your imagination. Picture the area with nothing around but miles and miles of desert, no water except at the white tanks, no food except what you were carrying, and the danger of being caught trespassing by the Apaches. And then ask yourself “what are you doing there?” The answer was gold. 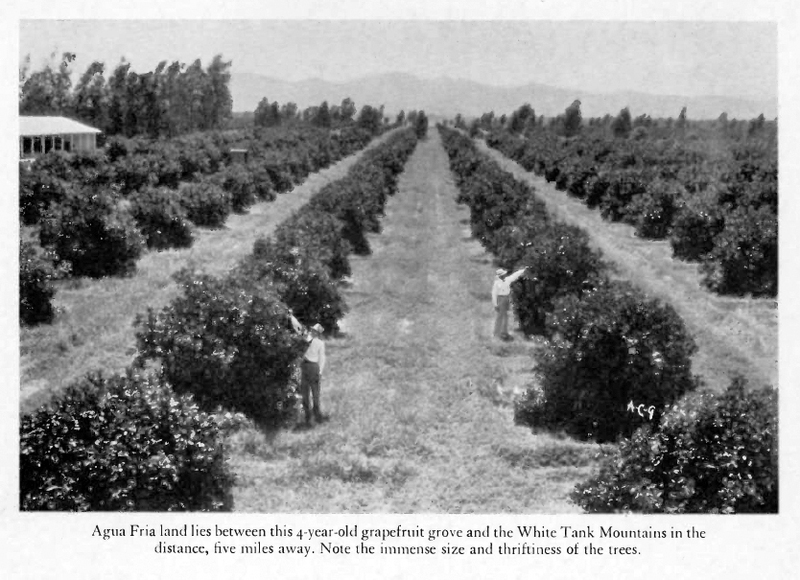 Image above: The White Tank Mountains in the 1930s.